Maiduguri, Nigeria – Retired but not tired. This is how people describe Hauwa Lassa, a nurse and midwife who came out of retirement to care for women and girls affected by the conflict in northeastern Nigeria. Her skills are desperately needed. There is an alarming shortage of skilled health personnel in the region. The violence has left more than 40% of health facilities either destroyed or badly damaged, and many doctors and nurses were forced to flee. Women in Nigeria already face one of the highest maternal death rates in the world – a woman dies of pregnancy-related causes about every nine minutes. The conflict has aggravated this dire situation, leaving around 8.5 million people in need of life-saving assistance. Millions have fled their homes, filling displacement camps and host communities in the three worst-affected states, Adamawa, Borno and Yobe. UNFPA estimates that 1.7 million affected women are of reproductive age, meaning they will require reproductive health care and support. Some 276,000 of these women are likely to become pregnant this year. Health personnel are critically needed to provide reproductive health services, including obstetric emergency obstetric care and treatment for survivors of sexual violence. “Well-trained doctors, nurses and midwives, like Hauwa Lassa, are the bedrock of our mandate to save lives,” said Ada Pouye, UNFPA’s humanitarian coordinator in Nigeria. 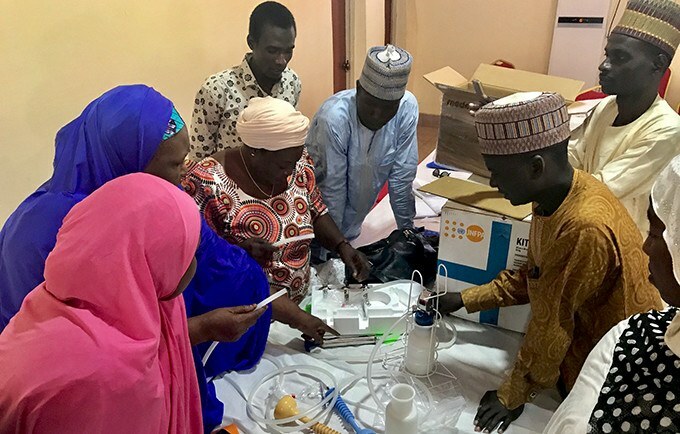 To help these personnel work in a complex humanitarian environment, UNFPA is training them in the Minimum Initial Service Package – a series of actions required to meet reproductive health needs in a crisis setting. These actions include coordinating with humanitarian partners, providing clinical care to survivors of sexual violence, preventing HIV through condom distribution and other measures and facilitating access to emergency obstetric care. “This, together with equipping the health facilities and hospitals with supplies for safe deliveries, access to family planning and equipment to respond to sexual and gender-based violence is one of the cornerstones of UNFPA’s work here,” said Mr. Pouye. Mdapilawa Yatzubu also participated in the UNFPA training. She works in a health center in the local government area of Biu. There, she and her colleagues manage an average of 150 deliveries per month. They also provide antenatal care, family planning services and immunizations for newborns. “We have a special way of making women come back for the second immunization shot for their baby after 40 days,” said Ms. Yatzubu. “We give them a small gift, mostly soap. They all come back to collect the soap and have their health checked and the baby immunized with the second dose. This is how we follow up on them.” She sees her share of pregnancy complications, most of them involving bleeding, hypertension and sepsis – potential fatal conditions. “If the women have complications that we cannot manage, we refer them to the general hospital,” she said. Establishing a referral system for emergency care is one of the requirements of the Minimum Initial Service Package. So far, the efforts are working. “Right now, we have had zero maternal deaths in our health facility,” Ms. Yatzubu said. And she is determined to keep it this way. This post originally appeared on the United Nations Populations Fund (UNFPA) website. Read other posts from the MHTF’s Global Maternal Health Workforce blog series.